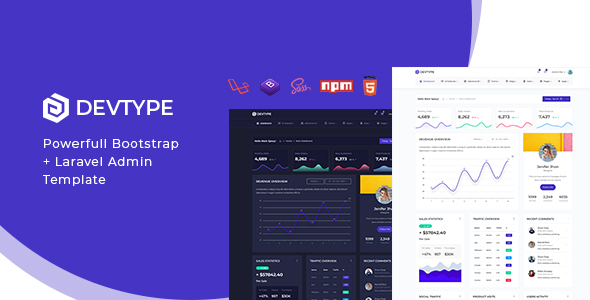 Devtype is a modern Bootstrap 4 admin template and UI framework with full Laravel version. Devtype is fully responsive Admin Dashboard built for everyone who want webapps and bulit them with Top Framework like Bootstrap. It is fully responsive built using SASS, HTML5, CSS3 and jQuery plugins and packed with smart developer tools. Devtype helps you to create your next Bootstrap Webapp Project even faster then before. It can be used to create a SAAS based interface, admin panel dashboard, accounting software, project management, eCommerce backends, CMS, CRM, ERP or anything you want to build on the web.Devtype helps your team moving faster and saving development costs.